Explore a world of fun at the Newly Renovated Best Western Plus Raffles Inn & Suites located within walking distance of Disneyland� and Downtown Disney�. The Best Western Plus Raffles Inn & Suites features Victorian-style architecture with 108 beautifully appointed guest rooms for almost every party size and preference. This property features several different suites including our two bedroom two bath family suite. Each guest room offers all the conveniences of home including free high-speed Internet access, refrigerator, and microwave and 46-inch television with cable. Rooms are decorated with the most up-to-date decor including granite vanity tops with his and hers dual sinks, Spanish-tiled bathrooms and rich wood furniture. We offer two different floor types including brand new carpeting and stylish hardwood floors. We are proud to be the only Best Western in the area to offer such a wide variety of suite types. Upgraded suites provide accommodations for six to eight guests, some feature bunk beds and two bathrooms. Our hotel also offers a heated pool, hot tub, meeting room space, and a guest laundry as well as a fitness center. 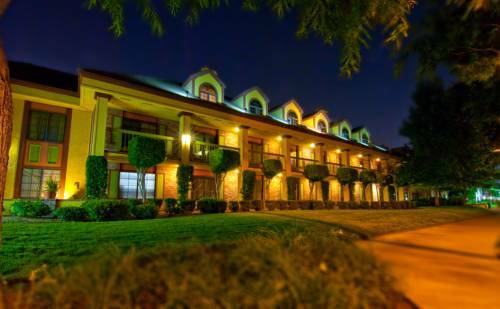 This Disneyland� area hotel offers a full breakfast, served complimentary to all guests in the hotel's spacious breakfast area. The friendly staff is committed to making every guest's stay fun, comfortable and memorable with first-class quality accommodations and legendary service while visiting Anaheim. Make a reservation today and save! Enjoy your stay. An additional daily parking fee of $15.00 per vehicle per night is not included in estimated fees. Valet parking available 24-hours. Room deposit required. �From: Interstate 5 South. Exit Harbor Boulevard right. At Orangewood make a U-Turn, the Best Western Plus Raffles Inn & Suites is on the right. �From: 5 North. Exit Harbor Boulevard left. At Orangewood make a U-Turn, the Best Western Plus Raffles Inn & Suites is on the right. �From: Interstate 57. Exit Katella and travel west for two miles. Turn left onto Harbor Boulevard. Make a U-turn at Orangewood, The Best Western Plus Raffles Inn & Suites is on the right. �From: Interstate 22. Exit Harbor Boulevard and travel north for three miles. The Best Western Plus Raffles Inn & Suites is on the right. 7.50 mile(s) from Ripley's Believe It or No, a collection of real-life phenomena and scores of curiosities that are so obviously strange and yet so mystifyingly true.